Johnny Quick is an evil version of the Flash, living on another version of Earth. He is part of a motley crew of similar “reversed” super-heroes, the Crime Syndicate. There have been several takes on this concept. This profile covers the Johnny Quick who was first seen in Grant Morrison’s Earth Two graphic novel. Thus he appeared from 2000 to 2005. Marital Status: Unrevealed, presumably Single. Group Affiliation: Crime Syndicate of Amerika. Base Of Operations: The Panopticon. Height: 6’ Weight: 145 lbs. By injecting his designer drug, Johnny Quick gains superspeed. His experience with moving at accelerated speed allows him to apply to it to other abilities, notably creating wind currents and moving through solid objects by altering the vibration of his molecules. In the “Syndicate Rules” storyline, Owlman at one point negates Johnny Quick’s superspeed, claiming to have shut down the “speed-juice delivery system” in Quick’s costume. 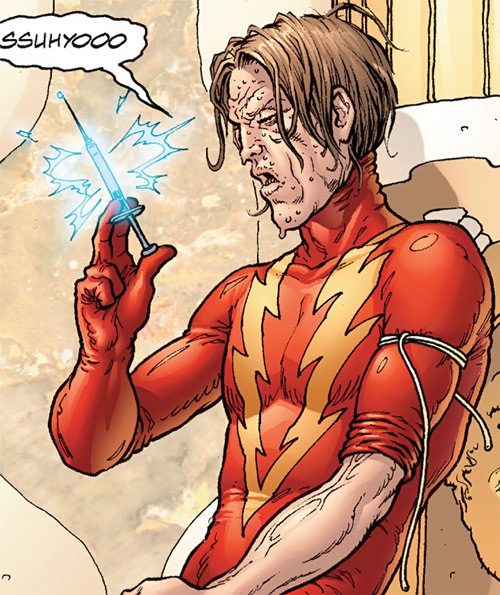 However, Johnny Quick is shown powering up both in Earth 2 and “Syndicate Rules” by injecting speed-juice via a hypodermic syringe. In the latter case, he is even told to do so in order to regain his superspeed by Owlman. The explanation for the discrepancy is unrevealed. One possibility is that activating Johnny Quick’s superspeed requires a large amount of the chemical to be administered in a single shot, while maintaining it only requires smaller continuous doses. In other words, he shoots up to reach maximum speed, then uses a steady release mechanism in the costume to maintain that speed. This device may operate much like a medicinal patch. Whatever the mechanism, it is unobtrusive and easy to transfer from one suit to another. Johnny Quick retained his speed while wearing a copy of the Flash’s skintight uniform without any modifications or distortions being visible on said outfit. The people of the anti-matter Earth are generally driven by amoral self-interest and lust for power. This tendency would cause the societies of that Earth to quickly fall apart if it were not for the Favor Bank. This is the one inviolate rule of the cultures of the anti-matter Earth. The effect of this is that all people of the anti-matter Earth have, in DC Heroes terms, the equivalent of a Catastrophic Irrational Attraction to repaying debts when the marker is called. On those few occasions when people violate this rule, whatever passes for the local authorities will quickly bring the offender in for trial. Such offenders are usually put to death, though it is possible they would be granted a second chance if they can show a good faith effort was made to repay the debt. The matter and anti-matter universes have not only physical but moral differences. In the matter universe, good ultimately prevails, while evil is the dominant force of the anti-matter universe. Within each universe, this is represented thus — the prevailing force tends to have better stats and more Hero Points than their opponents, especially in the aggregate. When the JLA and CSA first met, this difference was expressed more dramatically. When individuals from one universe crossed over into another, they became less efficient. In DC Heroes terms, their HP expenditures were raised as if they were operating one Genre lower than the usual campaign setting. For example, if the campaign is set in the Action Genre, those who have crossed over into other universe spend HPs as if they were in the Mock-Real Genre. This apparently only applies if the individuals crossing over were at odds with that universe’s moral bias. When the heroic Alex Luthor of the anti-matter universe crossed over into the matter universe, he was not affected. However, when the CSA traveled to the matter Earth they did suffer this disability. This imbalance between the universes was negated as part of the universal restructuring of the DCU when Krona was defeated in the JLA/Avengers crossover series. The essential character of the two universes — that good triumphs over evil in the matter universe and vice versa in the anti-matter realm — remains the same though. The Crime Syndicate of Amerika is the JLA of an Earth in an antimatter universe where good is evil and evil is good. Benedict Arnold was the first U.S. President, Washington was a traitor, Britain fought for its independence against an Amerikan colonial power, etc. It is a reversed DCU. By large, things are pretty upbeat in the DCU. People are generally happy, secure and open to the wild and the novel by virtue of living in a world where good always triumphs in the end, thanks to colorful superheroes. By contrast the dreary inhabitants of the antimatter world live on a planet dominated by lies, greed and hypocrisy. If that world sounds all-too familiar, then you’re just too cynical by half… There vice and corruption are a way of life and the bad guys always win. Here crime is the founding principal of society. Evil is rewarded, cruelty is lauded and people live everywhere in fear of their masters. This goes all the way through the local mobs and the corrupt police, the bent journalists and up, through City Hall and the governments, to the top of the pyramid – the seedy Crime Syndicate of Amerika and its vicious bullying leader, Ultraman. Johnny Quick’s personal history is largely unrevealed. He received his powers by killing another speedster and filtering the critical elements for his superspeed drug from the decedent’s blood (Interview with Grant Morrison). Quick could not get the enhancements to take permanent effect, so he must regularly inject the speed-juice to maintain his powers. Johnny Quick and Power Ring act as liaisons between the CSA proper and the lower elements of the Crime Syndicate — organized crime heads, presidents, etc. It’s not a particularly enjoyable duty, but as the junior members of the CSA, Power Ring and Quick don’t have much choice (JLA: Earth 2). The CSA’s dominion was temporarily disrupted when the last free superhero, Alexander Luthor, traveled to the matter Earth and convinced the Justice League to intervene on the anti-matter Earth. The CSA launched a retaliatory strike on the matter Earth as a prelude to conquest, only for both teams to realize they could not prevail in the universes opposite their own. The two groups then discovered that the universal crossover was part of a plot by Ultraman’s servant Brainiac. He had secretly engineered the confrontation to regain his freedom and expand the power of his consciousness. The latter goal required Brainiac to take actions that would have destroyed both Earths. 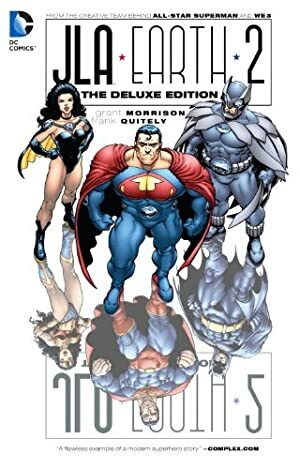 Working with the JLA, the CSA was able to return to their Earth, after which they took their revenge against their rebellious servant by lobotomizing him. Having established a strong dominion over the entire planet with the fall of the rebel nation of Modora, the CSA continued to seek out new places to conquer in their own universe. They eventually discovered the planet Qward. They were in the midst of ravaging Qward when their universe and the matter universe were both destroyed and restructured as a result of Krona’s experiments (JLA/Avengers). Seeking to discover what had happened and to prevent it from occurring again, the CSA returned to the matter Earth. Their initial mission was satisfied when they found out that Krona was responsible but had been neutralized by the JLA. However, the CSA had also discovered that the imbalance between the universes had been eliminated by the restructuring and they began a reign of terror on the matter Earth. The Qwardians also came to the matter Earth following the CSA’s trail. They sought revenge for their attack on Qward as well as wanting to find Krona themselves. The JLA redirected the Qwardians to the anti-matter Earth and then made the CSA ask them for help in repelling the Qwardians, gaining a favor in the favor bank from the anti-matter villains. The Qwardians eventually quit the field of battle against the two supergroups. The CSA sent the JLA back to the matter Earth, bitterly aware that they owed the heroes a favor. 17 countries to riot against the Syndicate. Two other superteams to break allegiance with them. 20 insurgencies led by superbeings to begin around the world. A break-out of the entire Justice Underground from Ultraman’s Flying Fortress. Johnny Quick looks like what he is: a strung-out addict in need of a fix. When he’s under the influence, he regains the appearance of health and vitality. His costume is a red body suit with yellow boots, two yellow lightning bolts coming over the shoulder and down the torso to waist level in the same position that suspenders would be in, and a chrome crash helmet. When he’s just taken another hit of his speed-juice, he gets so jittery that he leaves a series of afterimages around him. When he’s not under the influence of his superspeed drug, Johnny Quick has the bearing of a heavily sedated man, slurring his words. When he’s jacked up, he’s like an anxious little boy constantly underfoot asking questions and making wise cracks. Air Control and Dispersal are Skilled Powers that are Contingent upon Superspeed (+5 Base Cost each, -1FC each). Air Control and Dispersal represent Quick’s experience at using Superspeed for various applications, and thus can only be used when he has that Power, i.e. when he has injected his speed-juice (-0 FC as this is an extension to the Contingent Limitation). Expansive Headquarters (The Panopticon), Scholar (Designer Drugs). SPEED-JUICE [Power Reserve (Dex, Str, Bod): 06, Superspeed: 24, Limitations: Power Reserve must be divided evenly among the Attributes, regular use of the drug causes a CIA to it, each dose’s effects only last for 15 APs (one day)]. This is the drug Johnny Quick now uses to give himself superspeed. It gives him such a powerful metabolic boost that all of his physical abilities are enhanced as well. HELMET [BODY 06, Shade: 08]. By Roy Cowan and John Colagioia. Source of Character: DC Comics. Helper(s): Grant Morrison (interview) ; Gareth Lewis.